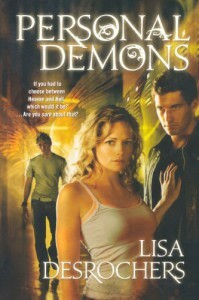 Personal Demons by Lisa Desrochers, is a story about Frannie, who is your typical high school student. Then two mysterious ( and gorgeous ) boys turn up at her school, Luc and Gabe. Each begin to vie for her affections, and both have an affect on her emotions. however its more than her affections they both want.. it's her soul. Luc is a demon sent by the devil, and Gabe is an angel sent by God. There actions and feelings dictate Frannie and her choice he must make. There was a little love triangle going on, which was well done but not always my thing. however the whole book wasn't completely focused on this. I loved the descriptions that Desrochers gave of hell, and like the reference to the smells of each emotion. An entertaining read, with some great scenes and a lot of humour. Would definitely recommend.